The meaning of the upright position of the King of Wands represents pure energy. Unlike the other wands cards in the deck however, this particular one is not focused on pure creativity. Instead, this king is actually way more likely to take an idea and to decisively implement it himself. 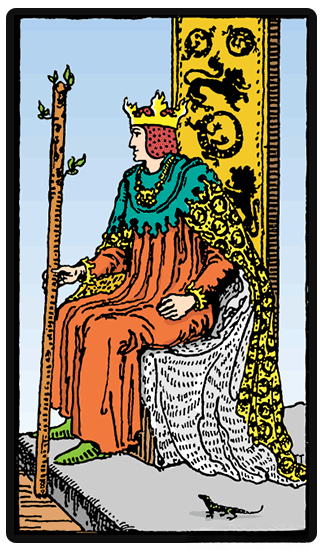 The King of Wands is a natural born leader of people, and he is also extremely capable. Once the king sets for himself a certain aim or a goal, he is going to conveniently stick to it in order to ensure that it becomes a reality. The King of Wands is a natural born leader of people, and he is also extremely capable. The King of Wands looks forward to all sorts of different challenges - whether great or small, for he gets a natural adrenaline rush associated with the solving of problems. The negative aspect of the card is associated, as you may guess, with a feeling of arrogance. He can even be rather aggressive in the actual pursuit of his goals, regardless of whether he s actually conscious or not of it. He wouldn t show restraint, nor even the humbleness to know when his assistance isn t actually required. When reversed, the card depicts a personality which is prone to taking rash, impulsive and hasty decisions. This person could be pushy, overbearing as well as dominating at times. Even though he might rarely do this with a sense of malice or with an intention to make someone feel submissive, this is without a doubt a part of his character that one can be frustrated at. In reversal, the card represents the worst spectrum of the qualities of the fire – selfishness and ruthlessness. He can be manipulative as long as you are serving his purpose. With this in mind, the card definitely points out strong and weak aspects, and reflecting on his image can help you dig deeper in your personality.